With rural buses under threat across the UK, it takes someone brave or driven to start a completely new rural commercial service network in an area where the views are fabulous but the chimney pots are few. Steve Hurst is both brave and driven. At 29 he has the advantage of the energy of youth but his decision to launch services based on Rothbury in Coquetdale in deepest Northumberland is based on anything but a whim. He has spent the best part of two years researching it and carefully tailored everything to provide as much integration as he can for as many potential users as he can. The result is Spirit Buses which began operating on Monday 1 September. I visited the following afternoon to find out what has motivated him to start the venture, how it was planned and what he hopes to achieve. Born and bred in Rothbury, where his parents run a delicatessen, Steve knew that he wanted to work in the transport industry when he left school but wasn’t sure whether to opt for air, road or sea, as one of his passions is the ferries of CalMac serving the Scottish Islands. He took a gap year after his A-levels to decide and is still on it! He found a summer job at Newcastle University helping to administer a rural demand responsive transport scheme called ‘Phone & Go’. People in the area could ring in up to an hour before they wanted to travel and be carried by one of a fleet of Mercedes minibuses equipped with mobile data terminals that were run by local independent operators under contract. The idea was to take people to other transport hubs. ‘I won ‘Employee of the Month’ when I developed and introduced training manuals for the staff. I was there about three years before the scheme dwindled through a lack of funding. It has since been replaced with vouchers that can be used for taxi trips,’ he said. 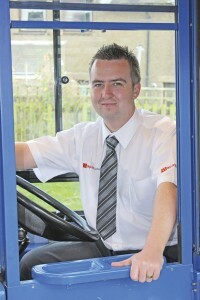 Unemployment prompted Steve to go for his PCV driving licence and he started driving for Northumbria Buses which was subsequently acquired by Go North East. The operation was noted for running some unusual prototype vehicles including a Plaxton Volvo concept bus and the unique Pointer bodied Bluebird which Steve says, ‘Went like a rocket.’ When, after a couple of years, Go Ahead swapped the operation based on Ashington’s Jubilee estate with Arriva for its Hexham depot, he found himself working for Arriva who soon moved the business to their main Ashington depot. After six years driving, he decided he had enough experience of it. He’d gained further skills as a yard supervisor and leading driver with Go Ahead but reckoned his opportunities with Arriva were limited. When the chance to go to London for the Olympics with Classic Coaches came up he saw it as an opportunity not to be missed and spent over three months there. ‘It was the most fantastic experience in my life,’ said Steve. ‘We were based at Heathrow and it was completely different to anything I’d done before. For the main Olympics we were assigned to Samsung based at the Landmark Hotel.’ Having never driven in the capital it took some adjusting to the pace. On his first day it was all ‘after you’ but he soon realised he wasn’t going anywhere and adopted a more aggressive style. For the Paralympics he drove new Citaros converted to carry additional wheelchairs between the Royal Holloway Campus and the Olympic Stadium. He took a part time job with Rothbury Motors, based in Alnwick, a private hire operation focused primarily on school contract work. He explained what his intentions were and they were extremely supportive. Working part time gave him the middle of the day free to study for his Transport Manager CPC and the time to research and analyse whether local services in Coquetdale could be viable. To assist in the work, once the basis of a proposal had been drawn up, he had 2,000 tick box type questionnaires printed asking potential users detailed questions about whether and when they were likely to use bus services if they were provided. They went out in April 2013 with some delivered door to door and others through village pubs, shops and post offices. The next eight months were spent gathering feedback by word of mouth as well as using the forms. The spine of the proposed provision was a service between Rothbury and Alnwick, extended at the Rothbury end to the village of Thropton and at the Alnwick end to connect with the main East Coast railway line at Alnmouth. He also consulted on two other possible routes; one linking upper Coquetdale with Rothbury and the other a Friday and Saturday evening service to Morpeth, inviting respondents to make any other comments or suggestions they wished. Around 400 of the questionnaires were completed and returned and there was considerable local enthusiasm for the idea. Encouragingly, what came back was that those interested in using the new bus links were split 50/50 between fare payers and concessionary travellers, which was rather better than the 80/20 in favour of concessions that he had anticipated. ‘The vibes were all very positive and a lot of additional comments and questions were raised,’ he recalled. Armed with the information, he was able to analyse the costings, look at what type of bus was needed, determine what capacity it should have and, crucially, what he would need to earn. All of the positive feedback was heartening for Steve but at the end of the day, as the proposed services were all to be commercial, the risk would be his, so he had to be as sure as he could be that it was sustainable. At one stage it appeared that he might be able to source £20,000 from Central Government through Northumberland National Parks. An initial application was knocked back and a subsequent one that looked more promising was also ultimately unsuccessful. In the end, Steve decided he had no alternative but to fund the launch himself through bank loans and help from his parents in supporting him with living expenses. He calculated that he needed £60,000 to be up and running with a contingency until fares and rebates started coming in. He didn’t approach any other operators for help, though he says that all of the local independents have been extremely supportive and have offered their assistance. I’ll be honest, I’d never heard of Coquetdale or Rothbury before Steve contacted Bus & Coach Buyer via our Twitter account to ask for advice on sourcing some of the items he needed. If, like me, you are wondering about the pronunciation, the trick is to treat the Coque bit as if it were a well known soft drink. It is a tremendously beautiful part of the world. 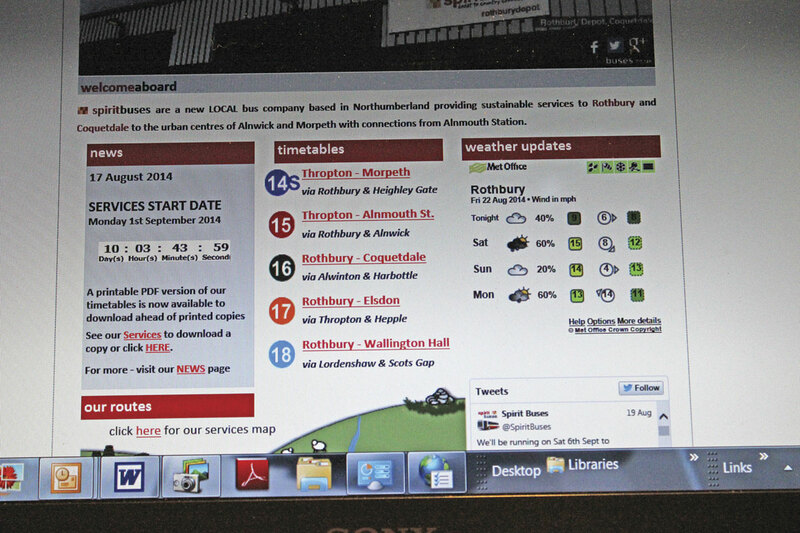 Rothbury does have an existing bus service provided by Arriva, but it doesn’t provide a direct link to Alnwick. The 14 runs approximately hourly from Morpeth to Thropton using double deckers. It connects with the X14 in Morpeth to provide a service to Newcastle. Services operate from Monday to Saturday, the first in each direction leaving Thropton at 06.35 and the last at 19.55 arriving in Morpeth at 20.39. The first to Thropton leaves Morpeth at 08.55 and the last departs at 19.05 arriving back outside the Three Wheat Heads in Thropton at 19.49. A problem for the 14 and for Rothbury at present is that the B6344 between Longframlington and Rothbury has been blocked by a major landslide for the past two years and it is not likely to reopen for at least another year. All traffic now has to take a lengthy detour to the north via the A697 and B6341. Coming along the A697 you would be forgiven for thinking Rothbury had ceased to exist as the village name has been painted out on a succession of signposts. It means that, to get to Alnwick, a Rothbury resident would have to take the bus to Morpeth, wait there for up to an hour, then travel an hour north to Alnwick, for a journey that should take about 20 minutes. At one time, Rothbury did have its own United Automobile Services bus depot. Part of the building is still there, now serving as a veterinary surgery, though the yard has houses on it. The realities of bus operation have changed immeasurably since then. Using the feedback, it was clear that there was not sufficient demand to run services from all parts of Coquetdale every day so a network was devised built around five daily return trips on the Alnwick to Rothbury corridor, with other aspects built in. The reasoning was twofold; to get local people between the two places and to appeal to tourists. Alnwick was recently voted one of the best places to live in the UK. It is a top tourist destination in its own right with Alnwick Castle & Gardens heavily linked into the Harry Potter story, on top of which there is the National Trust’s Cragside estate, and Rothbury’s position as ‘The Gateway to the Northumberland National Park’ among other tourist draws. In addition to the 15, Spirit will be operating the 16, 17 and 18 routes which, unlike the 15, do not offer Sunday or Bank Holiday services. All connect with departures on the 15 (which uses the same bus). 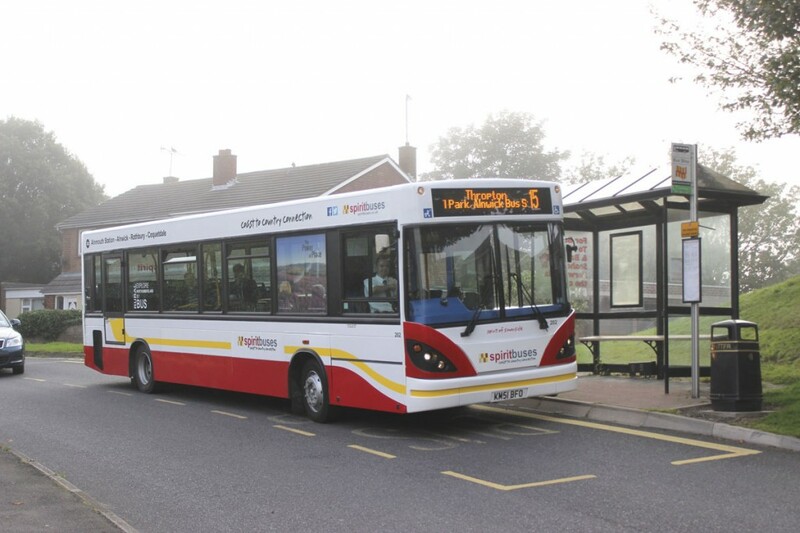 The 16 is a Coquetdale Circular that takes in Thropton, Snitter, Netherton, Alwinton, Harbottle and Sharperton and will run twice daily every Tuesday, Thursday and Saturday with an additional evening run on Fridays and Saturdays. The 17 is a Rothbury to Eldson service calling at Thropton, Caistron and Hepple offering two return trips every Wednesday. 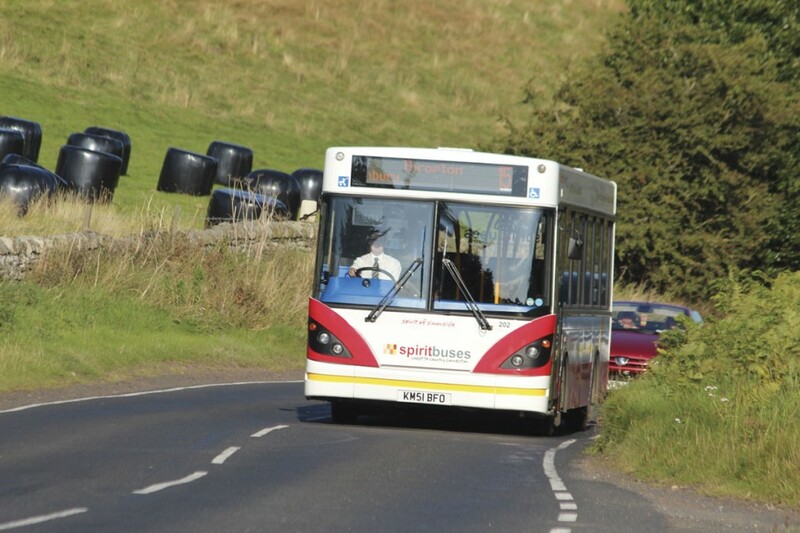 The 18 runs from Rothbury via Lordenshaw, Scots Gap and Cambo to Wallington Hall twice every Monday and Friday. 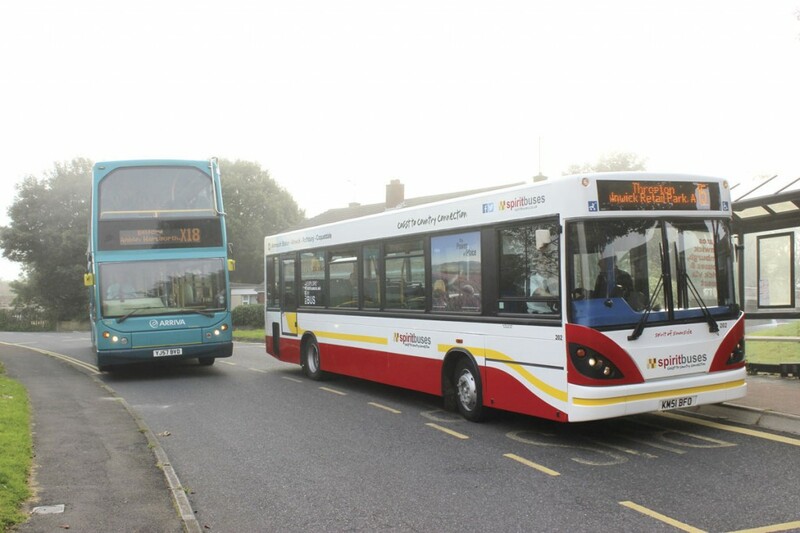 On top of this, Spirit Buses is commercially providing the 14S Sunday service providing two return trips from Thropton to Morpeth via Rothbury, Longframlington and Longhorsley, connecting with Arriva’s X14 to Newcastle at Morpeth. These are interspersed between the 15’s two Sunday departures. The services are designed to operate using one bus with a second identical vehicle run as a spare. In practice, the intention is to alternate their use to make sure that both remain reliable and ready for action. Steve really wanted to operate Volvos ‘as they are so hardy’ but the cost was greater and he eventually settled on a pair of 10.2m Caetano Nimbus bodied Dennis Dart SLFs. One has a 51-plate and the other an 02-plate. In keeping with the strongly local identity of the company, each of the buses has been named. The 51-plate is ‘Spirit of Simonside’ after the nearby Simonside Hills, and the 02-plate is ‘Spirit of Coquetdale.’ They also have fleet numbers, 201 and 202 respectively, which is more to do with identifying them with the ticket machines rather than any delusions of grandeur. Steve is confident that the 10.2m length of the duo is the optimum for what they are doing. ‘An MPD would be too small for the 15, but anything larger would be too big for the valley routes,’ he said. Both are 33 seaters though for no obvious reason one is certified for 22 standees and the other for 26. A National O-Licence for two vehicles was obtained. Maintenance is clearly important and the buses will be inspected on a four weekly cycle by an external contractor. MOTs are being handled by Volvo in Blyth. Minor things that come up will be rectified by Steve. 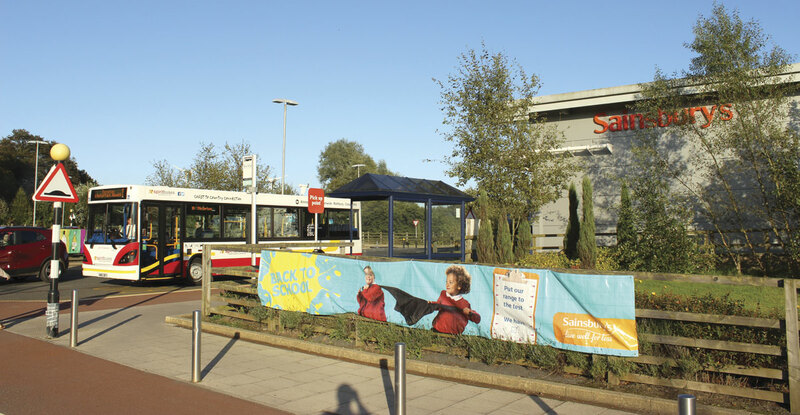 The work will be quite demanding for the buses which are covering around 160 miles every day, less on Sundays. 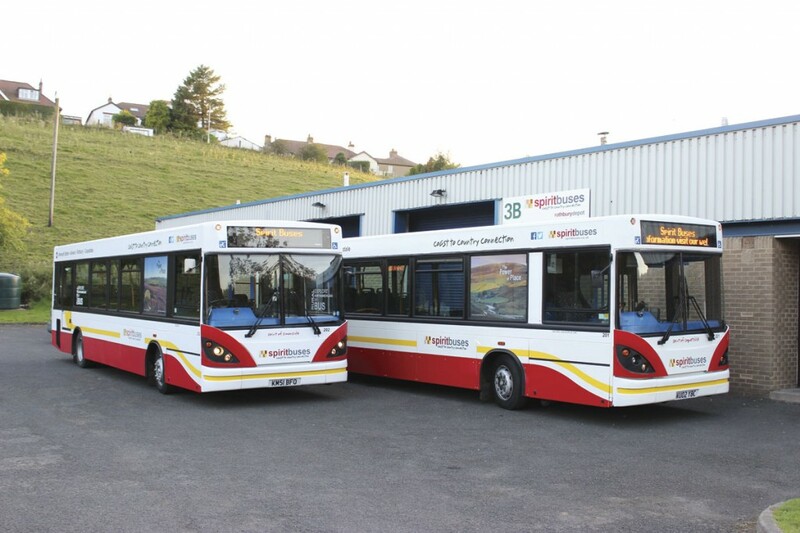 I wouldn’t have been entirely surprised if a business that will need to be very careful with its costs had been based in the corner of another operator’s yard, in a farmyard or somewhere else less than impressive but Sprit Buses has its own depot and offices that look very smart. Steve explained, ‘being a rural area I needed somewhere inside to avoid diesel theft and to keep them relatively warm in winter.’ Obtaining the premises on Rothbury Trading Estate was a matter of pot luck. It was the only unit of its size available in the area and had been sat empty for a number of years having previously been an abattoir. Friends and other local businesses helped him to bring it up to standard and it now provides a comfortable home, and perhaps a little scope for expansion. In the weeks and months prior to the launch there was extensive coverage in the local press. This was backed up in the week before the start by a publicity tour that saw one of the buses visit the villages that are being served. 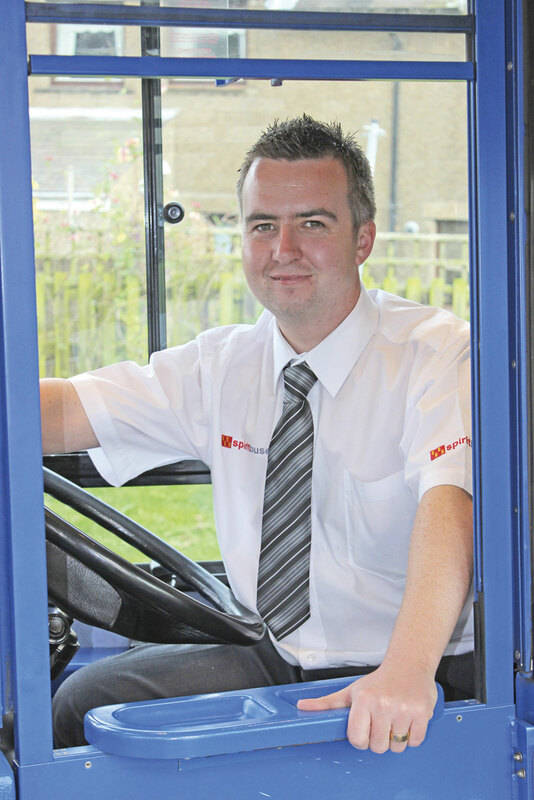 ‘We were able to speak to and reassure people who are not used to using the bus’ said Steve. He was surprised with the level of interest the tour created. On the Saturday before the Monday start, there was a launch event at which local celebrity, Rod Clements, a member of the group Lindisfarne, famous for ‘the Fog on the Tyne,’ cut a cake. Over the day around 300 people attended the event which attracted additional press attention. Steve had Spirit’s attractive www.spiritbuses.co.uk website up and running well in advance of the launch date, with a count down facility showing the time remaining until the first bus was to leave. 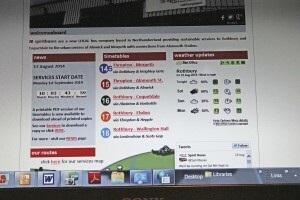 With full details of the services provided and when they run, it has a map and also carries a Met Office feed showing the next four days weather and a running twitter feed. Fares information includes details of the spiritdaypass (£6.50), spiritvalleypass (£5.00), spiritfamilypass (£12), tenjourneysaver (£22), spiritweekpass (£20) and onemonthpass (£70) with the promise of a twomonthpass and an annualyearpass still to come. Also soon to be made available are one day (£2) and annual (£400) Curlew Cards for pupils and students. It has been said that the 15 is one of the most scenic bus routes in the UK and there is sufficient justification for such an assertion. There is plenty to warrant a journey just for the scenic content and on the course of our trip three people from Southend who had learned of the service via the internet, boarded the bus having used it to tour local historic sites including the National Trust’s Cragside House and Gardens and the Castle at Edlingham. 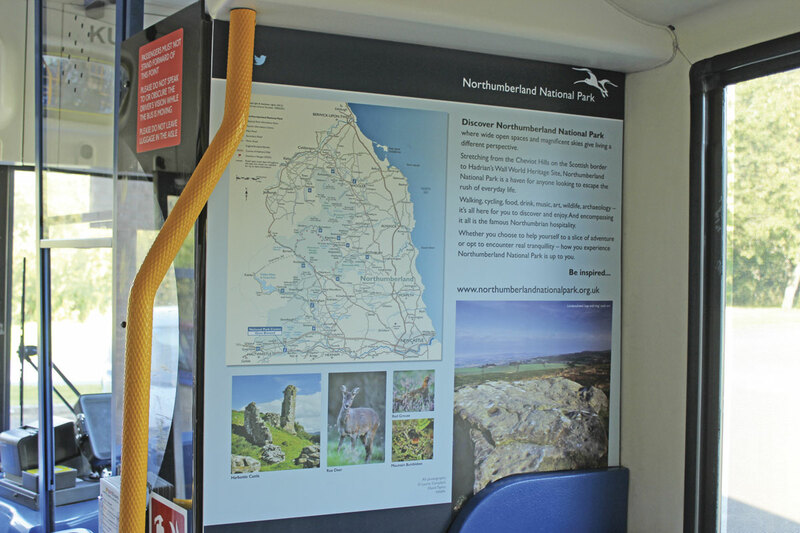 Northumberland National Park have paid for information boards and leaflet displays as well as external advertising on both of the buses. Different illustrated contravision panels promoting the area are carried on the first window to the rear of the driver on each vehicle. It might be beautiful but it can also get pretty bleak in winter, which is one reason that Steve was very keen to see the vehicles garaged, to help ensure that they are ready for the road and comfortable for passengers every morning. He admits the weather can be a major challenge but the local authority has a good record of keeping the road clear, especially since the only alternative route in to the area has been severed, and has a gritter stationed nearby. ‘Obviously if the bus is not running you’re not making money, but you have to put safety before anything else,’ he said. And why the name Spirit Buses, you may ask. Steve tells me it comes from ‘the local community’s drive to get a service running again.’ On a personal level for Steve there is also the spirit of his grandmother who always wanted him to succeed. The name works well for marketing. On Twitter the hashtag ‘That’s the Spirit’ has apparently gone viral in Rothbury. The livery was designed by Steve using the colours of the Northumbrian flag and applied by a friend with a signage business. Likewise, the logo features the flag’s red and yellow. It can be seen on the uniforms Steve has sourced and also on the website and printed timetables that he designed. Some 10,000 colour leaflets have been distributed. The CCTV and the Ticketer ticket machines weren’t fitted until two days before the services went live. ‘We’d planned it all months in advance; everything was there, done and dusted ready for the first day,’ said Steve. ‘Ridership has been exceptional, unbelievable,’ said Steve, who tempered his delight by observing that the first two days of operation were sunny. He sees a lot of reason to be optimistic that the patronage needed will be forthcoming. ‘Genuinely, the amount of people who’ve said, “I’ve not used a bus in years but I’m going to apply for my pass and start doing so”, has been tremendous. Especially enthusiastic are people up the valley who the three valley services are designed for, who only run a car to do their shopping because they have no local shops,’ he said. I’m not surprised they welcome an alternative, diesel is £1.59.9 a litre at the garage in Thropton! Steve has also had emails from as far away as Australia and New Zealand from people who plan to holiday in the area and use the service. Spirit Buses has built good foundations and made a good start. The business is rooted in the local community and it is local support that will ultimately decide whether it succeeds or fails. 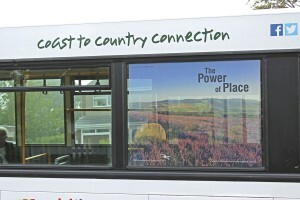 Steve’s assertion that, ‘It’s more than a bus service it’s a community spirited venture,’ is an accurate one. There are many aspects that can be developed, with opportunities as more people look to take car-free holidays, but these will probably be a relatively small percentage of the income. ‘The plan is to keep it like this for at least a year, give it a good go and concentrate on promoting it,’ said Steve. Chris Wright, who is as excited about the project as Steve is, commented that ‘We both hope to still be here in 30 years,’ though Steve wondered if by then he might not prefer to be on a Scottish Island watching the ferries. Money may be tight but Steve does not appear to have cut any corners in establishing the operation. 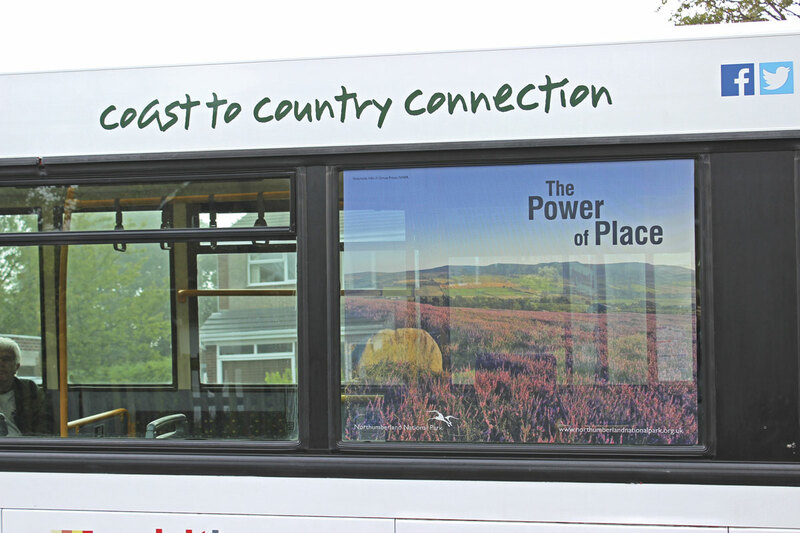 It has the sort of premises that many an operator would be delighted to operate from, the buses, staff and promotional media are smartly presented, they are CPT members, and every effort has been made to engage with the people that the business exists to serve. An array of good luck cards in the office is evidence that there are a lot of people hoping Spirit Buses succeeds. Nobody can predict what will happen in the future: whether the current level of local enthusiasm can be retained and built upon, what the effect will be when the more direct route to Morpeth reopens, whether sufficient commuter traffic can be generated and even what weather conditions will be faced in the winter months, but whatever does happen, Steve and Chris are determined to give it their best shot and do all that can humanly be done to make sure it succeeds.